We want to make sure that you have your course packets ready for the first day of class (see below for submission deadlines). Also, throughout the year, whenever you require copyright clearance on materials for your classes (handouts, uploads to CourseWeb, etc. ), we are here to help you. For more information about copyright clearance, please contact Greg Sciulli at The University Store on Fifth, gsciulli@bc.pitt.edu or 412-648-1461. If you meet these dates and all copyrights are granted, we guarantee your packets by the first day of class! Due dates are for your request form, bibliography, and originals. Please prepare the bibliography in the order in which you would like the articles to appear. If the book that the article appeared in is an anthology, please make sure you include the information for the publication in which material originally appeared. We will need this in order to obtain copyright permission. Production and/or sale of course materials without the proper acquisition of copyright permissions can place both the University and the individual faculty member at legal risk for violations of federal copyright law. To prevent any legal concerns, The University Store's custom course packet manager provides professional copyright clearances for faculty members. The University of Pittsburgh Policy on Textbooks, Supplies, Instructional Materials and Subscriptions (Policy# 05-05-01) strictly prohibits the sale of any course materials inside the classroom. The University Store on Fifth provides one convenient location for your students to purchase textbooks and course packets. If your course packet contains any material from sources such as journals, books, magazines, newspapers and the internet, copyright permission is required. Even though it is for educational use, and may only be one page, it does not fall under fair use. We will obtain copyright permission for you. Keep in mind that the permissions process may take as long as six weeks. To help expedite the process, even if you do not have your originals ready (in hardcopy or digital format), you may send us the copyright information and we can start the process of procuring copyright permission for the content you wish to use. We will also let you know if any of the permissions are unusually expensive or delayed. 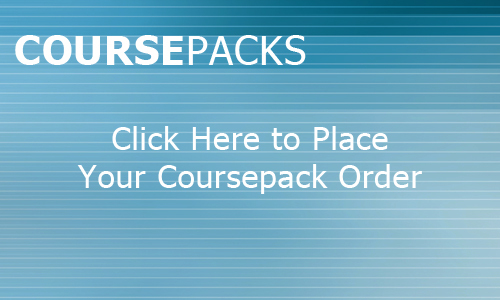 We are committed to keeping the cost of your course packet as low as possible. Please be aware that copyright permissions are good for one semester only. We must re-submit permission requests each semester you use the materials.